It’s Political Hunting Season and All Candidates are Fair Game! I believe the English language is being destroyed by superlative adjectives. When I was young, pretty much everything you wore or ate could be described as small, medium or large. With the popularity of fast food restaurants (thank you very much?) we now have extra large, 2X and 3X in our clothing sizes. But those restaurants have even taken this to a higher level…we now can order SUPER-SIZED! Extra large just doesn’t cut it anymore, its got to be super-sized. How about that Big Gulp? Another item I have noticed about the destruction of the English language is how we differentiate our celebrities. During my youth, we had movie stars and television stars. That’s what they were called and that’s what they were. But now, if someone is being referred to as just a movie star, they are being denigrated. You have to be a SUPER STAR or you ain’t diddly by the standards of today. Other terms I have heard to describe celebrity performers are A Lister or Uber Star. A Lister? When I was attending school, I usually had a B+ average. Most people would think that was pretty good but do you think any celebrity would be referred to as B+ lister? Uber? Isn’t that German? It’s not even Spanish. What’s with that? Isn’t there a cab company called Uber? Are all the drivers German? Admittedly, I did not watch this speech. I did, however, see these headlines from two different news sources on the internet the next morning. I was appalled. Did Trump really have a meltdown? Then my local newspaper arrived. The event was close enough geographically to the newspaper offices for them to send reporters. Can you guess what was reported about the ‘epic rant’ and the ‘freak out’ by journalists that were actually in attendance? Not much. They reported about the issues that Trump talked about and the audience response to the issues. It was positive. What the reporters did relate was that there was a microphone issue and that Trump was bantering about “firing the person responsible” and “not paying the company that was responsible” You will be glad to learn that no one was fired and the responsible company did get paid. It was classic Trump and part of his mantra of not tolerating substandard employee performance, especially government employees if he were elected POTUS. (Remember his TV show, The Apprentice? Same reaction, You’re Fired!, different format.} Out of curiosity, I found the parts of this speech concerning the microphone on Utube. There were three short snips of his comments about the microphone in a speech that was almost two hours long. I particularly watched the audience reaction to determine if he was indeed having a meltdown. He wasn’t and the audience was eating it up. It was quite amusing and certainly did not warrant the above mentioned headlines. The media made a deliberate effort to bury the issues of his speech and to exaggerate his delivery and demeanor. Here is the amazing thing about these headlines. They all appeared on the same popular news site on the same day! Look at the descriptive words being used to affect public opinion: ‘staggering remark,’ ‘slams,’ ‘explosive assault,’ ‘goes ballistic.’ This is not the way journalism reported when I was growing up. This is a political campaign, but if you look at just the descriptive words you would think we have begun World War III! I know most of this piece has been about Donald Trump and for good reason. He appears to be the Republican front runner at the present time. As a result, he is being attacked by his fellow Republican candidates that want to destroy his lead in the polls. He is being attacked by the Democratic candidates. And….most importantly, he is being attacked by the liberal media. I guess it just wouldn’t be the same if the first headline read, “Cruz responds directly to Trump for the first time.” How about, “Republican Party Selects CNN for Super Tuesday Debate.” Did I convey the same message with a greatly toned-down rhetoric? How about this headline, “Bush spars with Trump supporter over foreign policy.” Spars? Isn’t sparring a boxing practice used to get ready for a big match? Was Bush actually boxing with a Trump supporter? Of course he wasn’t, but apparently when it comes to politics, the media is all about aggression and aggressive descriptions. “White House fires back at Palin after Obama Attack.” Did they shoot her? Did she conduct a military operation or use ninjas to attack Obama? Could this not have read, “White House responds to Palin’s comments about Obama.” Just saying, this is the way it would have been reported 50 years ago. Here is another one: “Clinton delivers brutal criticism of Sanders’ abilities.” Take out the word brutal and the headline still delivers the same message. I apologize for not having more Democratic examples, but they only have two viable candidates versus a platoon of Republican candidates. Here is one of my biggest pet peeves. It has been a pet peeve of mine for about 30 years. It is the political candidate that says, “If you elect me…..I will fight for you” Fight for me? Doesn’t that statement imply we have enemies even though we are all Americans? Is this the reason we don’t get diddly-squat done in Washington? I want my representatives to communicate, debate, identify and compromise on what is for the good of our country. Leave the fighting to the Department of Defense. Firstly, it is only January and we have too many months to go before the election. We will hear more and more of this type of rhetoric until we finally become numb to it, as most of the population has done already. Additionally, it has become commonplace to use all these exaggerated superlatives by the younger generations. If my grandkids ask me how I am feeling, and I reply ‘good,’ they are concerned I am dying because I didn’t reply that I was ‘great.’ Trust me when I say that the baby boomers were brought up in a more civilized era of reporting with far less super-sized adjectives. Secondly, Trump has become the principle blaze orange deer prancing through the woods because he is the perceived front runner, much to the chagrin of too many people. He will remain the biggest and brightest target until he either wins the election or gets dethroned as the perceived Republican leader. I am convinced that if Abraham Lincoln was the conservative front runner in this fall’s election, he would be treated the same. That is the way politics has evolved in America. 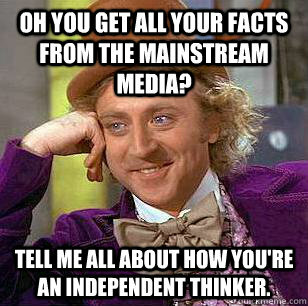 Thirdly, the media is not going to change or let up on their form of rhetoric and opinionated, false reporting. They will continue it to sell advertising and to express their opinions in the most dynamic rhetoric possible. What has changed is their beliefs and efforts to tell the truth. As the saying goes, ‘don’t let the truth get in the way of a good story.’ And they haven’t as witnessed by my example of Donald Trump’s Pensacola speech. Relating the truth played a very small part of what was reported. So here it is readers. Most media sources think that the average American is too ignorant to separate the chaff from the buckwheat when it comes to political issues and political candidates. Prove them wrong! Do not let the rhetoric get in the way of the truth. Don’t make your political decisions because of the way you ‘feel’. That is what the media is hoping for as a way to destroy your objectivity. That is how they bias your opinion with the use of superlative adjectives. Do research. Get facts. Make sound decisions and ask pertinent questions before voting. The future of our country depends on it. This entry was posted in Common Sense, Common Sense Solutions, Congress, Growing Up in America 65 Years Ago, Political Insight, Political Opinion, Politics and tagged baby boomers, Bernie Sanders, biased media, Donald Trump, Election 2016, false reporting, Faulty microphone, Hilary Clinton, Media Bias, opinionated reporting, Pensacola speech, political decision making, Presidential debates, Sarah Palin, superlative adjectives, Ted Cruz on January 22, 2016 by Grandpa T.
This past Monday provided me with a clash of emotions. I went to the mail box and received a letter from Rick, the senior class president for the class of ’66. I knew that our 50 year class reunion was looming on the horizon. Yippee! Skippee! Then I opened the letter and read the front page. Time. Check. Date. Check. Location. Check. There it was, another outstanding job by Rick and his wife Debbie in once again getting our small class together. 61 graduates of a small school in the farming heartland of the Midwest meeting once again. What could be more exciting than to see your old classmates! Then, I turned the letter over to read the backside. Seven of our classmates have died since our 40 year class reunion. Seven! Since Grandma P and I moved to the southeast almost 8 years ago, seven classmates died. I was not aware of five of these seven passing. Combined with the classmates that died earlier, 20% of our class of 61 graduates will not be attending the reunion. I am still in shock….not only from the number that died, but also by the people that died. Now here is something that happened in our small town that would be very rare today. Over half of the class of ’66 spent all twelve years of school together. Yup. In retrospect, I spent more time with my classmates in school than I spent with my sister and parents at home. Once we reached high school, classes promptly began at 8:17 AM. Lunch was from 12:17 PM to 12:47 PM. You learned how to eat quickly and efficiently. The end of the school day was 3:41 PM. Well……it wasn’t the end for most of the students. That is when the extra curricular activities began, or, if you were one of the farm kids, it is when you got home to assist with those farm chores. There were members of our class that never participated in those extra curricular activities because they were needed on the farm. I need to point out that because of spending all twelve years of school together, the boys and girls in our class really did become our brothers and sisters. A confession. I only kissed one girl in our class. She and I were juniors. She was attractive and intelligent and desirable…..but, it was really like kissing your sister. (What did you expect? A Kardashian moment?) I never dated a girl in my class again. Because of the small size of school, we were able to participate in many of those extra curricular activities. Band, chorus, class plays, operettas, sports, school newspaper, class yearbook; a whole myriad of activities. And….like the old joke……..’our town was so small that we had to take turns being the town drunk’, we needed participation from grades 9-12 to have a chorus, a band, and to produce an operetta. If nothing else, our class was well-rounded because the majority of us were doing three or more extra curricular activities. Sometimes this expanded to 6 or 7 extra curricular activities throughout the school year. The class of ’65 had the greatest singers and actors. The class of ’66 had the athletes. We had five very talented athletes in our class. Rick, Steve, Dave, Don, and Bob S. were all multi-sport talented athletes. When we were juniors, our football team was undefeated and won the conference championship. That team had only four seniors on the team with two of them being starters. The next year, as seniors, we again went undefeated and won the district championship. We were rated as high as 13th in our state in football. This was done before the time of 5 or 6 school athletic divisions, with a tournament to determine the champion in each division. Not bad for a small school with over 600 high schools in our state. The five guys mentioned above were the leaders of that team. The rest of us provided a pretty darn good supporting cast. Our high school won the state golf championship three years in a row! Not bad for a bunch of small town kids taking on the metropolitan large schools. We had other successes in wrestling, basketball, baseball, cross country and track and field. Those were our sports in addition to football. Like all graduating 18 year old students, we had ambition. We had aspirations. We all had hopes, dreams and optimism about our futures. Some of these hopes and dreams may have been unrealistic…but give us a break, we were 18 years old and high school graduates! Sadly, some of our classmates could not cope with reality. Where they were once vaunted high school athletes, they were now, unceremoniously, demoted to regular guys. They couldn’t cope. Don the athlete, the stupidly funny guy in our class, committed suicide. He did this after getting out of the military. Bob S. was determined to have died recently. Even his surviving brother does not know how he died as he separated himself from his family. All his brother knew was that he died in Florida. Both of these guys were the closest thing we had to Viking ‘berserkers’. When they were playing football, they suffered no pain and were only going to cause carnage for the other teams. Their attitude was catchy for the rest of the team. But both, good friends to each other, never quite got their train on the tracks of life. Sad. Roberta was the class salutatorian. She got a masters degree in nursing. At the 40th class reunion, she and I shared stories of where we had traveled. We determined that of all the classmates, she and I had traveled the most. At the bar, she and I were joined by Jim M. and his wife Patty. The four of us chatted. I am the only survivor of those four. I did not know of Roberta’s passing. So, this is my Ode to the Class of ’66, and its gone, but not forgotten members: Judy, John, Rich J., Bob L,, Jim, Don, Roberta, Loren, Bob S., Kathy, Dan, Rich R. and Ruth. I will never remember you as the grandmothers and grandfathers many of you had become, but as the fresh-faced eighteen year old graduates filled with hope, ambition and aspirations. Rest in peace, my brothers and sisters. This entry was posted in Common Sense, Growing Up in America 65 Years Ago, Political Opinion and tagged 50 year class reunion, baby boomers, class reunion, Ode to the Class of '66 on January 13, 2016 by Grandpa T.